I raided the shelves of my family "general store" to make it through the week. We don't pay our kids an allowance. Working together is part of being a family--not a job. However, we do offer incentives for special projects or extra duties. But how frustrating is it to see your kid fork over 5 hard-earned dollars for a junky little toy? That's when I came up with the idea for a family general store. As the shopkeeper, I stock the inventory when I see good items, secondhand. This lets me pass along low prices without passing up excellent games and toys. When kids accumulate money or reach an important goal, they can choose to shop at home instead of Target. My lack of consistency has been the only flaw. Otherwise, the shop-at-home tradition has been a great time and money-saver for all of us. What an awesome idea! I stock up on great deals for gifts and such but never thought of it this way. Thank you for the tip! Oh my gosh, what a wonderful idea! I really don't like to see my children fork over their precious resources for something that will be short-lived and I also like to pick up little treasures either on clearance or second hand but I really dislike just giving the kids those things. Like you, I'm also not a fan of allowances because as you said, working together to maintain a household is just a family's job. Each one is expected to pitch in if they want to reap the benefits of being a family. I love this idea! My kids tend to go for the "junky" stuff, too - even at thrift stores! I was raised on an allowance system AND with the idea that chores are not optional so I don't think the two are incompatible. It worked well for me so its what we will be doing with our son. I also think there are some valuable lessons to be learned with kids spending the money themselves on lesser quality products only to figure out for themselves its garbage (I would of course offer guidance along the way). However, I like the idea of using the family store some of the time. I've been wondering how to handle the small treasures I manage to accumulate at yard sales and clearance aisles. I definitely don't want him to be spoiled. You are a genius! Love it! And I read your other post last night - hope you are feeling better soon! What a smart, smart idea. Definitely going to be doing this! This is a great idea!!! Thanks for sharing this! This is brilliant. We don't do allowance for chores, either and this is an excellent solution to one of my recent worries. Brilliant as usual Meredith. I have had that sinking feeling, riding home from the store with a child who has just overpaid for something that will be broken in a matter of days. What a great idea! I'm not sure my teens will fall for it, but I wish I'd thought of it when they were younger. My kids are past this age, but I'm just wondering: do your kids know what is in the Family General Store before they receive it? In the past I would stock up on clearanced goodies, but after one view of the contents of the gift drawer, the novelty, and thus effectiveness, wore off. I SHOULD NEVER HAVE LET THEM SEE the drawer! The thrill of the hunt, the novelty, is why a trip to the toy store (or a clutch of yard sale $$$) was more effective for my kids. Knowing the Gift Drawer Contents was more of a problem when another kid's birthday rolled around. Especially during 1st-4th grades ... if the gift was not PHYSICALLY BIG, they didn't want to give it, no matter how cool I thought it was. I eventually quit buying ahead and started giving Hula Hoops (cheap, BIG) in BIG (handmade) fabric bags. I agree with Michelle in HI. I do think anyone around 5 or older (adults included!) should have some money to use as they see fit. Hopefully, one can learn from money spent unwisely. Children often want a special toy that maybe their peers have and parents are not likely to find at a garage sale or on clearance to put in the "store". I think they should have the option of saving up for that toy to buy in a real store if that is their choice. I do, however, think the home store is a good idea for rewards. Like you we don't link allowance and chores. My mom and dad combined allowance and chores and it didn't work out very well. Other people may havehad different experiences, though. What a great idea!! My son is only 16 months old, but very soon he will be getting an allowance, and I am totally going to steal your idea! Deb, I don't keep a whole lot on hand, and they don't see it unless they have money to spend. Otherwise, they would be pestering me for a reward all the time! If we are out shopping and they spot something great, I will buy it and set it aside, and if they don't have the money at that time, then they have it to work toward. This also prevents the pitfall of going back to the store, only to see the item already sold, or making a trip to the yard sale/thrift store and NOT finding anything they like. We also don't buy into the mindset that they have to have what everyone else has. They have certainly had the experience of buying junk toys but small kids have a hard time remembering that lesson from one time to the next. Obviously this is a different issue for a 2 year old than it is for a 7 year old. I pre-select the toys that they get for birthdays, etc. to prevent the meltdowns from broken and junk toys. Doing the same at home gives little ones some freedom of choice without having to take everyone to the store. I also give them a quarter or 2 if they come to a yard sale with me so that they can have the experience of choosing in another retail-free environment. Believe me, they learn fast that they can get a whole lot better toy used than at Target. After we bought the Click-its for those low prices, we looked them up online to see how much they would have cost. As I wrote above, they do have the option of using their money at home OR going to Target to spend it. Many times Andrew has saved his birthday money, first tooth money, and money from special projects toward a new Lego set. He has learned quickly that $5 buys a tiny little Lego kit or $5 at a yard sale buys a big tub of assorted specialty Lego pieces or sometimes even a new kit that hasn't even been opened! Wanna know how my wealthy friends stay 'wealthy'? By doing the very same with their children! The gift closet and me are girlfriends - The 'candy bowl' is too - The candy bowl is made up of dried fruit with amix off m&m's *that I make* - when they get that for doing an awesome job on various things - with a candy orange slice thrown in - LOOK OUT! I can't thank you enough - You ROCK! That is BRILLIANT, Meredith! Thank you for sharing! LOVE IT!! !I feel the exact same way, especially when I'm sneaking a cheap broken toy into the garbage a few days later...I'll be starting this soon, for sure! Thanks for the great idea! sensible, Meredith! Thanks for expanding on the topic. What a wonderful idea!! I can't believe I haven't seen this elsewhere! Thanks....i'll be using this. Meredith, you are a genius. This is a great idea! We struggle with the boys wanting the latest brand or character. It's gotten much better since we started homeschooling and don't have the peer pressure, but still occasionally they get envious when their cousins have the newest "thing." Your idea helps them see the value of what they buy while empowering them and you at the same time. Great idea! I'll be keeping my eyes open at garage sales for this very thing. My mom has a "bag of tricks" for the grandkids to play with. It's mostly crafts and second hand toys. They love it! This is a great idea! 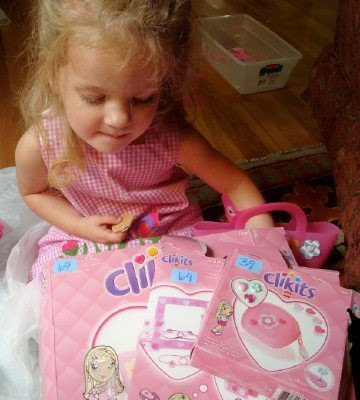 And my girls LOVED those click-its when they came out a few years ago!!! Why don't I think of good ideas like this? I am so stealing this! I adore this idea. It can be very frustrating when the children gravitate toward junky toys that will break in minutes of them owning it. I'm going to borrow this idea as I thrift this summer. I think this may be the best thing I've read on the internet ever! We just started allowance but she only gets $2 a week and she needs to save one. The other one she can spend or save for something larger. I can't wait to try this. How do you price things in the Family general store? I did this when I was teaching. The children in my classroom earned "money" each week (taught them to count money) and on Friday's they could spend their money in our general store. They loved it! I don't know why I haven't thought to do that at home yet?? I guess my kiddos are still too little. Thanks for sharing!! we used to do this....cause constant begging for something from the store...and then we did no money, got to pick something from the stash..and then i cut back on shopping alot...so now they earn quarters..they are 6 and 8..
we ask for help with certain things..they either accept with a cheerful spirit and often get rewarded with a quarter, or be whiny about it, still have to do it and not get a quarter..
we go garage saling and no longer buy them stuff, they do themselves , and we discuss things, if they want to waste it, hopefully they learn..
its the first thing that has worked well, encouraged with real money skills and that i've been able to be consistent with..
Have but a moment to stop in and say.... I love this idea! It is truly heartwrenching to see them pay their hard-earned money for something I know will probably break in a few days time... thank you, friend. That is a fabulous idea. I'll have to keep that in mind for my little guys. did i comment already? (sorry, so tired i can't remember!) if not, i just wanted to say this is a GREAT idea!!!! thank you! Love it! Our fourth grade teacher did the same thing (where I used to teach) to teach the kids about economics. Then at the end of the year they all sold their own products at a big store. Fun stuff! This is so super fantastic. I am going to start thinking about how to implement this in our home. Thanks for triggering some brain waves on my part! I love the idea and I'm looking forward to trying to implement it with my three boys. I love this idea, Meredith! Especially since it would allow my little ones to get a more immediate reward. Sometimes fulfilling their promised trip to a store for a treat takes a few days or longer, which is really a letdown when they have worked hard to finish a task in a timely manner. This idea is genius! I share your sentiments about watching them spend their money on trash... only to be lost or forgotten almost immediately. I love this idea. I'll be using this, for sure. Thanks for sharing.